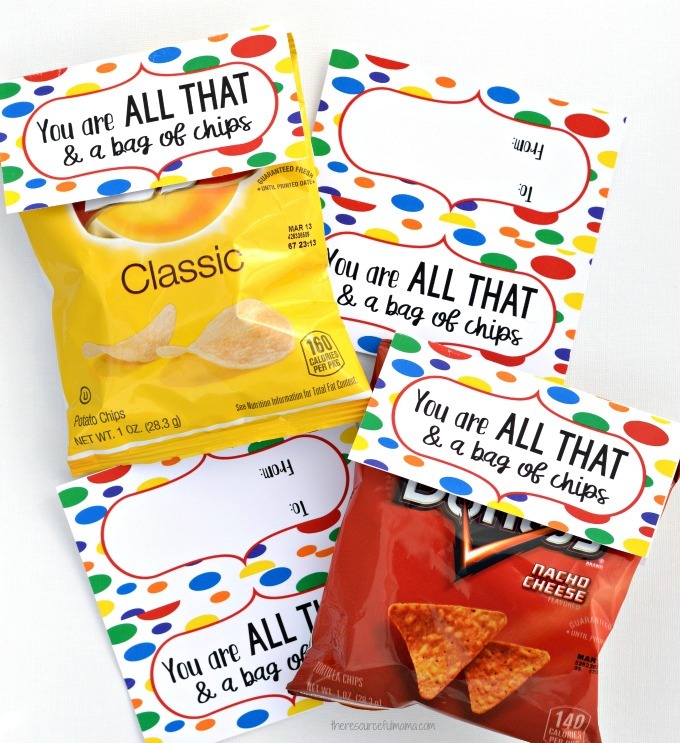 Chips and “You Are All That & a Bag of Chips” cards make simple, quick, inexpensive, and kid approved Valentines for older kids. Finding a Valentine that a 5th grade boy approves of is bit tricky. Gone are the days they couldn’t wait to pick out their favorite character cards at the grocery store. Anything too cute or displaying too much emotion is now strictly forbidden. Yet, as mom I know this is all coming to an end. Soon he will be entering junior high and the days of Valentine parties and handing out Valentines to classmates is almost over. We have to do something fun, but not too over the top and sentimental. I’m putting together a couple of different Valentines for older kids, who are way too cool for character valentines, but not quite ready to give up on the tradition yet. I love doing something for Valentine’s day that will actually be used (or in this case eaten). I love the dollar store, but I don’t need anymore dollar store trinkets getting lost in the kids’ bedrooms. Chips are the star of the show in this Valentine. What kid doesn’t like chips?! I grabbed one of those multi packs of chips at the grocery store. to make these Valentines. This Valentine is simple, quick, easy, and inexpensive to put together and best of all it’s kid approved. Just in case you need more convincing of how great these are; they are don’t have any mention of Valentine’s day or hearts, so they can be used for anything: birthdays or a simple congratulations. 1. Print the All That Valentine cards on white cardstock paper. There are two cards per page. 2. Using scissors or a paper trimmer cut out each Valentine card. 3. Complete the to and from section of the cards. This will be the back of the card. 4. 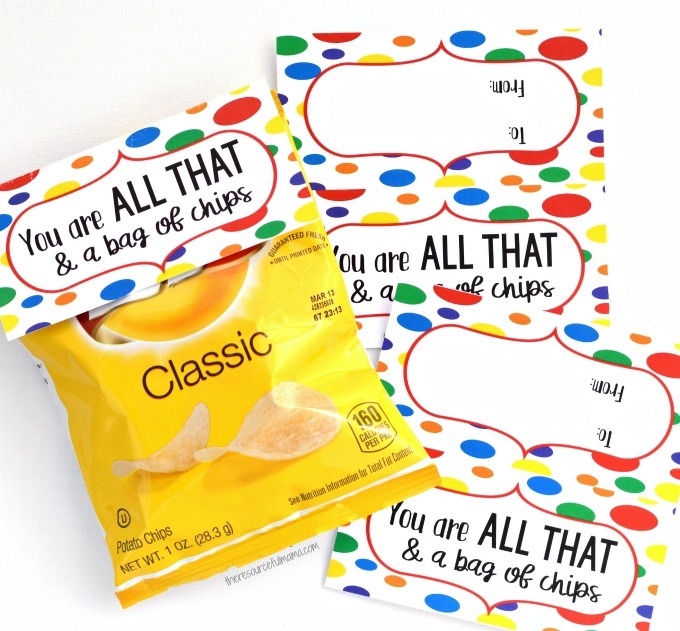 Fold each one in half, creating a card that shows You Are All That & a bag of chips on the front and to/from on the back. 5. Using a stapler or tape, attach a folded card to the top of a each bag of chips. 6. Hand out chip bag Valentine to classmates.